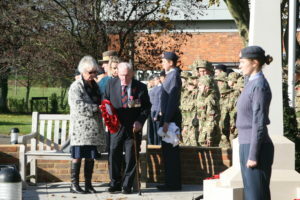 We were honoured that Sternian George ‘Johnny’ Johnson, MBE DFM (287) came to unveil the new war memorial at our Remembrance Service on Friday, 10th November. It was a very moving service with the whole school, staff, Sternians and guests in attendance. We were also honoured with a fly past from one of the chinooks based at RAF Odiham. All in all, a wonderful occasion. Look out for more photos on flickr via our Gallery page.